On your website on Envaya, you can create a Network page, where you can list organizations that partner with your organization and describe how you work with them. These organizations may include partners that fund, support, or work with you, as well as networks of organizations where you are a member. You can add organizations to your Network page even if they are not registered for Envaya. 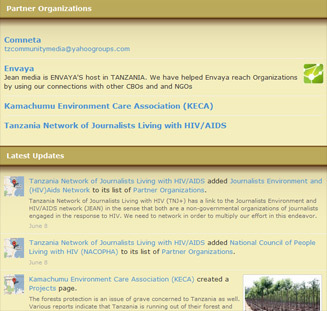 To create a Discussions page, log in to Envaya and go to the Edit Site page ( ). Scroll down to the Edit Pages section, and click Network. To add a partner organization, click Add Partner Organization. Then, enter the name of the partner organization, and any available contact information, and click the Add Organization button. Envaya will search organizations that have already registered for Envaya with that name and contact information. If the organization is an Envaya user, click Add to add them to your Network page. If the organization is not an Envaya user, you can still add them to your Network page. If they have an email address, you can invite them to join Envaya. After you add the partner organization, click Add description to add more information about your organization's relationship with the partner organization. Click the View Page button to see how the Network page looks on your organization's website. At the top of the page is a list of your partner organizations, with links to their websites. Below is a summary of the latest updates from all of your partner organizations on Envaya.